It's autumn in the small resort community of Serenity, NV and high school teacher TJ Jenson is fully involved in the seasonal festivities. TJ has lived in Serenity all her life and knows everyone. One person that she has befriended, Zachary Collins, is a scarred recluse who has had little to do with the community for years. But he and TJ have a shared passion for puzzles and Zachary delights in concocting puzzles and treasure hunts for TJ to solve. Even though TJ is very busy with the beginning of school and her recent guardianship of her very young half sisters she always makes time to visit Zachary. But when she arrives at Zachary's house she finds his dead body sitting in a chair. Even though Zachary is in his eighties and could be dead of natural causes, TJ thinks that something is wrong. For one thing, there is an open bottle od scotch next to his body and Zachary never drank. Zachary has left a box with a clue for her to solve and TJ begins to work on it, in hopes of finding out who might have wanted to kill him. 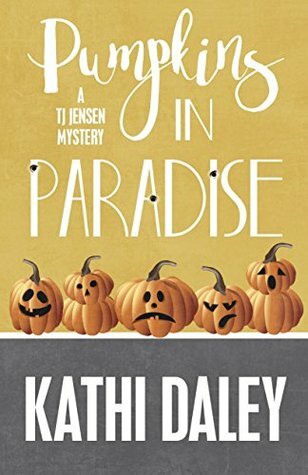 Pumpkins in Paradise is an intricately plotted cozy mystery, filled with quirky characters and small town atmosphere. 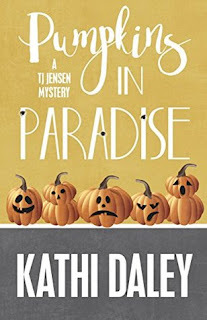 Kathi Daley is obviously a seasoned author who is able to juggle multiple characters and plotlines with ease. The clues that TJ turns up all come together to make a satisfactory, and heart-warming conclusion. I am looking forward to visiting Serenity and Paradise Lake again. Thanks to Henery Press and NetGalley.com for an advance digital copy in return for an honest review. My book is a memoir...no mystery.